Beginners yoga might seem too easy at first, but it is important to ease into yoga. This way, you will do the poses right and find out what type of yoga works best for you. Not everyone achieves the best results and state of mindfulness through the same yoga style. Before you go to your first class, check out this yoga guide for beginners and see which types of yoga interests you the most. Goals: Better balance and breathing in poses. Hatha yoga is a great place to start. This is considered a traditional form of yoga that focuses on breathing and select poses. As the website, doyogawithme.com, mentions, this type of yoga is usually gentle, slow, and relaxed. While it can still be active and engage your body, Hatha yoga, like in this Doyogawithme video, often helps you achieve better balance because the idea is to hold the poses for longer periods of time. Goals: Relaxation, stretching, and healing. Restorative yoga is a great example of yoga for beginners. While a lot of people use it to recover from injuries, it can also help ease you into yoga as a whole, loosen muscles after exercise or tension, and relax the body and mind from stress. Another special feature of this practice that can help beginners is its use of props. Blankets, blocks, and pillows are used to support weaker areas of the body in certain poses. They also add a sense of comfort to the experience. For example, if you are lying on your back, the instructor might suggest you put a blanket under your low back to support it while you stretch out your abdomen. Restorative yoga is a popular practice at the end of the day because it helps quiet your mind before bedtime. Goals: Increase circulation, and improve flexibility and patience. Yin yoga is another type of yoga for beginners because it emphasizes holding poses for long periods of time. The positions are often seated, but the idea is to hold them for 5 minutes or longer. As a result, you can stretch for longer periods of time than you normally would, which improves your circulation, flexibility, and patience. It moves very slowly, which helps beginners learn the poses well. It also sets up a great environment for peace and mindfulness. Goals: Correct body alignment and meditation. You can start Iyengar yoga as a beginner because it focuses on body alignment. This means that the instructor is going to make sure all of the students are holding the poses in the right way for their body. Naturally, this makes the class itself as well as the movements progress slowly. In order to get the poses exactly right and re-align your body, you must concentrate on this practice. As a result, breathing and concentration connect deeply to meditation in Iyengar yoga. This type of yoga for beginners can really help you adjust to the yoga mindset. It also allows you to perfect the poses since the instructor trained in alignment will guide you personally if needed. Goals: Strengthen body and practice flow. This is often described as the most “athletic” type of yoga. 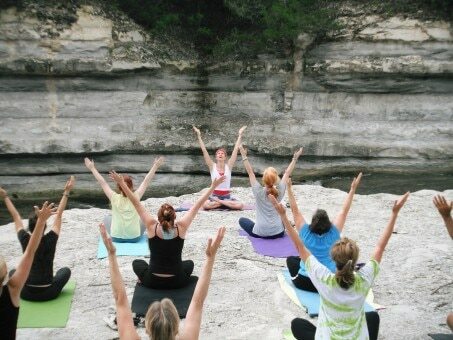 Vinyasa yoga, which can also be called a “flow class,” is challenging based on its “flow” movement. The word, “flow,” in yoga means moving through a series of poses gracefully with proper form. For example, a typical flow moves from a downward facing dog pose to a plank and then lowers down into a Chaturanga, which is basically the yoga version of a push-up. After holding this briefly, you raise yourself back up by flowing in the reverse order of those poses back to the downward facing dog. That being said, there are variations to each pose in vinyasa yoga. Most yoga teachers explain that if something feels too challenging, then you can stop the flow and return to a resting pose like child’s pose, for example. You can also continue the flow, but not lower down into a push-up, or modify the push-up by leaving your knees on the ground. A lot of vinyasa classes that are offered feature a vinyasa yoga for beginners section, so there is no need to feel intimidated by this particular practice. Now that you’ve read through the five best practices of yoga for beginners, pick the one that seems the most interesting to you and your goals and give it a try. Everyone’s body is different, so different yoga styles and poses will work for different people. The key is to know what interests you and what your body can and cannot do. This way, you can perform the variations as needed without worrying about hurting yourself. Yoga, even yoga for beginners, is meant to be relaxing, helpful, and fun, so all of these categories incorporate some level of this for both your body and mind.